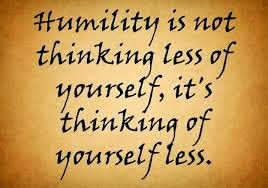 Reflections and Ruminations: Humility - one of the hidden life-changing truths that Easter brings. Humility - one of the hidden life-changing truths that Easter brings. There are undoubtedly many preachers and spiritual writers who have done marvelous work in their extolling of the wonders of the Resurrection, and how all of our lives pivot and hinge on its truth. Many will no doubt base their examples and content on how different individuals have encountered a turnaround in life, often from a position of weakness, suffering and failure, to one of strength, wholeness and victory, and cite these as Easter images of the resurrection. I have no bone to pick with them or their myriad examples. But from my own experiences, readings and reflections, it has dawned upon me that there is also a very hidden but real Easter truth that catalyses all those examples, without which nothing that hints of resurrection can ever take place. It is the virtue of humility. After all, it is humility that brings one to one’s knees to be able to develop a tolerance for any ambiguity in life. It is often the proud and the ones with the (self) assured answers to everything that have the most trouble with things like hope and faith. It doesn’t take much astuteness to see that one of the common traits of angry atheists like Dawkins and Hitchens is their glaring lack of humility for the many ambiguities that life presents. Just look at the way they often cite the existence of innocent children with wasting diseases and natural disasters as reasons enough to reject the notion that there is a God who is loving and all powerful. But it is only with humility that one takes all these equivocal and sometimes abstruse realities in one’s stride that one still decides, without bitterness, to fall on one’s knees to offer praise and worship to God, simply because one dares to admit that one doesn’t have all the answers. Easter resurrection has ambiguities, and in spades. They are often not logically laid out in some systematic way, and much as Jesus’ appearances have a certain consistency, they also have as much diversity in their array. To want resurrection to be ‘in your face’ and crystal clear is to miss the message of promise and hope that in life, it is often only with a second, third and sometimes multiple seeing that we then ‘get it’. Our frail egos and limited intellect demand proof before admission. But it is humility that helps us know that with faith, no proof is necessary. In fact, proof can sometimes become more of a stumbling block than a stepping stone. I am quite certain that the disciples who encountered the risen Lord did at times harbour a wish that the Lord would also appear to those whom they preached the kerygma too, to make their task much easier. But in his godly (read ‘strange’) wisdom, God’s preference is for the message to be handed down by a sharing. Whether it is a verbal sharing (preaching) or a socio-communal sharing (of one’s life in the community), it requires the virtue of humility. We often don’t understand or wish to even entertain the truth that we are in fact cramped together with other people in life, and that these people are much like ourselves (read “equally imperfect and often just as irritable”). Yet, the deep truth that is denied is that life is made much richer and deep when we are not alone. We are not made for self-sufficiency and self-achievement, no matter what our culture and our educational systems try to convince us otherwise. As columnist David Brooks wrote so eruditely in one of his recent articles for the New York Times, our culture and our educational systems may make great inroads towards building an external career, but they hardly make a dent in helping us build inner character. Humility is needed to achieve the latter. It must strike us as strange that in Luke’s account of the resurrection, Jesus asked his disciples for something to eat. Imagine that – the resurrected Lord, the one who is co-responsible for creation itself, the giver of all power in their earthly array, doesn’t conjure up food for himself ex nihilo, even though he can easily do so with a wave of his divine finger. He asks for food instead. In this simple action is a very hidden message of easter. The Lord of Life has it in his very DNA (metaphorically speaking, of course) a humility that he takes with him in the resurrected form. It is when we too live in a way that nurtures humility ourselves that we too become partakers in the resurrection, and giving cause to others to see the Lord very much alive in us. Perhaps it is then that we begin to descry a new dimension of the resurrection and value humility anew. NB: There will be a two week hiatus in this blog as I make my way to America to meet and thank my stem-cell donor and his family for the selfless act of saving my life almost two years ago. I am sure that I will document in some way this long-awaited meeting with this generous person. I am also very grateful for my readers' constant prayers for my physical well being and health. Life is too precious to take ourselves too seriously… a new perspective I am adopting, in hope of true self surrender for our Potter to mould me according to His design. There was this short anecdote about a middle-aged man who lived a life of humility, such that he impressed the whole town and so the residents decided to present him with a humility medallion, which he promptly wore on a gold chain round his neck, brandishing it in his neighbours’ faces. He became so insufferable that they had to recall it eventually! Seems that Humility like Meditation, operates on the same principle – once you think you have it, you have lost it! Morning, Fr Luke, we'll be praying that your trip will be well blessed with the great joy of meeting Peter. And yes, especially as we grow old, waning in vigor and power, we learn about humility, becoming more dependent on others, e.g. the love of the children, and we see that it's God who blesses us with more than we ask, deserve and attain. Have a safe and fulfilling trip, Love Ignatius & Florence (22 couples for May Weekend, how humbling, yet majestic).